For passive solar houses, see passive solar building design. Passive house (German: Passivhaus) is a rigorous, voluntary standard for energy efficiency in a building, which reduces the building's ecological footprint. It results in ultra-low energy buildings that require little energy for space heating or cooling. A similar standard, MINERGIE-P, is used in Switzerland. The standard is not confined to residential properties; several office buildings, schools, kindergartens and a supermarket have also been constructed to the standard. Passive design is not an attachment or supplement to architectural design, but a design process that integrates with architectural design. Although it is principally applied to new buildings, it has also been used for refurbishments. By late 2008, estimates of the number of Passivhaus buildings around the world ranged from 15,000 to 20,000 structures. As of August 2010, there were approximately 25,000 such certified structures of all types in Europe. The vast majority of passive structures have been built in German-speaking countries and Scandinavia. Bo Adamson, co-originator of the passive house concept. Wolfgang Feist, co-originator of the passive house concept, and founder of the 'Passivhaus Institut' in Germany. The Passivhaus standard originated from a conversation in May 1988 between Bo Adamson of Lund University, Sweden, and Wolfgang Feist of the Institut für Wohnen und Umwelt (Institute for Housing and the Environment, Darmstadt, Germany). Later, their concept was further developed through a number of research projects, aided by financial assistance from the German state of Hessen. Much of the early 'Passive Houses' were based on research and the experience of North American builders during the 1970s, who—in response to the oil embargo—sought to build homes that used very little or no energy. These designs often utilized the sun as a heat source and the term 'passive house' was possibly derived from the passive solar features of these houses, such as the Saskatchewan Conservation House and the Leger House in Pepperell, Massachusetts. The eventual construction of four row houses (terraced houses or town homes) was designed for four private clients by the architectural firm Bott, Ridder and Westermeyer. The first Passivhaus residences were built in Darmstadt in 1990, and occupied by the clients the following year. In September 1996, the Passivhaus-Institut was founded in Darmstadt to promote and control Passivhaus standards. Since then, thousands of Passivhaus structures have been built, to an estimated 25,000+ as of 2010. Most are located in Germany and Austria, with others in various countries worldwide. In 1996, after the concept had been validated at the Institute in Darmstadt, with space heating at 90% less than that required for a standard new building at the time, the Economical Passive Houses Working Group was created. This group developed the planning package and initiated the production of the innovative components that had been used, notably the windows and the high-efficiency ventilation systems. Meanwhile, further passive houses were built in Stuttgart (1993), Naumburg, Hesse, Wiesbaden, and Cologne (1997). Products, which had been developed for the Passivhaus standard were further commercialised during and following the European Union sponsored CEPHEUS project, which proved the concept in five European countries in the winter of 2000–2001. The first to be certified was built in 2006 near Bemidji, Minnesota in Camp Waldsee of the German Concordia Language Villages. The first US passive retrofit project, the remodeled craftsman O'Neill house in Sonoma, California  was certified in July 2010. Ireland's first Passive House was built in 2005 by Tomas O'Leary, a Passive house designer and teacher. The house was called 'Out of the Blue'. Upon completion, Tomas moved into the building. The world's first standardised passive prefabricated house was built in Ireland in 2005 by Scandinavian Homes, a Swedish company[which?] that has since built more passive houses in England and Poland. The first certified passive house in the Antwerpen region of Belgium was built in 2010. In 2011 the city of Heidelberg in Germany initiated the Bahnstadt project, which was seen as the world's largest passive house building area. A company in Qatar was planning the country's first Passive House in 2013, the first in the region. The world tallest passive-house is located in the Bolueta neighborhood in Bilbao, Spain. At 289 feet, Bolueta, a 28-story residential high-rise in Bilbao, Spain, become the world’s tallest building certified under the standard in 2018. The $14.5 million, 171-unit development (including a nine-story companion to the high-rise) consists entirely of social housing. While some techniques and technologies were specifically developed for the Passive House standard, others, such as superinsulation, already existed, and the concept of passive solar building design dates back to antiquity. There was other previous experience with low-energy building standards, notably the German Niedrigenergiehaus (low-energy house) standard, as well as from buildings constructed to the demanding energy codes of Sweden and Denmark. The building must be designed to have an annual heating and cooling demand as calculated with the Passivhaus Planning Package of not more than 15 kWh/m2 (4,755 BTU/sq ft; 5.017 MJ/sq ft) per year in heating or cooling energy OR be designed with a peak heat load of 10 W/m2 (1.2 hp/1000 sq ft), based on local climate data. Further, the specific heat load for the heating source at design temperature is recommended, but not required, to be less than 10 W/m² (3.17 btu/h·ft²). National partners within the 'consortium for the Promotion of European Passive Houses' are thought to have some flexibility to adapt these limits locally. The PHIUS + 2015 Standard primarily focuses on the reduction of the negative effects given by building operations, and it can be applied to all building types. This standard also uses climate data sets to determine specific building performance criteria for different regions. Such information is determined using metrics that represent a space where significant carbon and energy reduction overlap with cost-effectiveness. Overall, the PHIUS database includes over 1000+ climate data sets for North America. The PHIUS believes this approach to the Standard is essential, as North America has variety of different climates and different passive measures may be more effective than others. Achieving the major decrease in heating energy consumption required by the standard involves a shift in approach to building design and construction. Design may be assisted by use of the 'Passivhaus Planning Package' (PHPP), which uses specifically designed computer simulations. Passive solar building design and energy-efficient landscaping support the Passive house energy conservation and can integrate them into a neighborhood and environment. 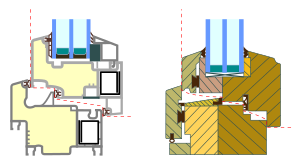 Following passive solar building techniques, where possible buildings are compact in shape to reduce their surface area, with principal windows oriented towards the equator - south in the northern hemisphere and north in the southern hemisphere - to maximize passive solar gain. However, the use of solar gain, especially in temperate climate regions, is secondary to minimizing the overall house energy requirements. In climates and regions needing to reduce excessive summer passive solar heat gain, whether from direct or reflected sources, Brise soleil, trees, attached pergolas with vines, vertical gardens, green roofs, and other techniques are implemented. Passive houses can be constructed from dense or lightweight materials, but some internal thermal mass is normally incorporated to reduce summer peak temperatures, maintain stable winter temperatures, and prevent possible overheating in spring or autumn before the higher sun angle "shades" mid-day wall exposure and window penetration. Exterior wall color, when the surface allows choice, for reflection or absorption insolation qualities depends on the predominant year-round ambient outdoor temperature. The use of deciduous trees and wall trellised or self attaching vines can assist in climates not at the temperature extremes. Passivhaus buildings employ superinsulation to significantly reduce the heat transfer through the walls, roof and floor compared to conventional buildings. A wide range of thermal insulation materials can be used to provide the required high R-values (low U-values, typically in the 0.10 to 0.15 W/(m²·K) range). Special attention is given to eliminating thermal bridges. A disadvantage resulting from the thickness of wall insulation required is that, unless the external dimensions of the building can be enlarged to compensate, the internal floor area of the building may be less compared to traditional construction. In Sweden, to achieve passive house standards, the insulation thickness would be 335 mm (about 13 in) (0.10 W/(m²·K)) and the roof 500 mm (about 20 in) (U-value 0.066 W/(m²·K)). To meet the requirements of the Passivhaus standard, windows are manufactured with exceptionally high R-values (low U-values, typically 0.85 to 0.70 W/(m²·K) for the entire window including the frame). These normally combine triple-pane insulated glazing (with a good solar heat-gain coefficient, low-emissivity coatings, sealed argon or krypton gas filled inter-pane voids, and 'warm edge' insulating glass spacers) with air-seals and specially developed thermal break window frames. In Central Europe and most of the United States, for unobstructed south-facing Passivhaus windows, the heat gains from the sun are, on average, greater than the heat losses, even in mid-winter. Building envelopes under the Passivhaus standard are required to be extremely airtight compared to conventional construction. They are required to meet either 0.60 ACH50 (air changes per hour at 50 pascals) based on the building's volume, or 0.05 CFM50/sf (cubic feet per minute at 50 pascals, per square foot of building enclosure surface area). In order to achieve these metrics, recommended best practice is to test the building air barrier enclosure with a blower door at mid-construction if possible. Passive house is designed so that most of the air exchange with exterior is done by controlled ventilation through a heat-exchanger in order to minimize heat loss (or gain, depending on climate), so uncontrolled air leaks are best avoided. Another reason is the passive house standard makes extensive use of insulation which usually requires a careful management of moisture and dew points. This is achieved through air barriers, careful sealing of every construction joint in the building envelope, and sealing of all service penetrations. Use of passive natural ventilation is an integral component of passive house design where ambient temperature is conducive — either by singular or cross ventilation, by a simple opening or enhanced by the stack effect from smaller ingress with larger egress windows and/or clerestory-operable skylight. When ambient climate is not conducive, mechanical heat recovery ventilation systems, with a heat recovery rate of over 80% and high-efficiency electronically commutated motors (ECM), are employed to maintain air quality, and to recover sufficient heat to dispense with a conventional central heating system. Since passively designed buildings are essentially air-tight, the rate of air change can be optimized and carefully controlled at about 0.4 air changes per hour. All ventilation ducts are insulated and sealed against leakage. Some Passivhaus builders promote the use of earth warming tubes (typically ≈200 mm (~7,9 in) diameter, ≈40 m (~130 ft) long at a depth of ≈1.5 m (~5 ft)). These are buried in the soil to act as earth-to-air heat exchangers and pre-heat (or pre-cool) the intake air for the ventilation system. In cold weather the warmed air also prevents ice formation in the heat recovery system's heat exchanger. Concerns about this technique have arisen in some climates due to problems with condensation and mold. Alternatively, an earth to air heat exchanger can use a liquid circuit instead of an air circuit, with a heat exchanger (battery) on the supply air. In addition to the heat exchanger (centre), a micro-heat pump extracts heat from the exhaust air (left) and hot water heats the ventilation air (right). The ability to control building temperature using only the normal volume of ventilation air is fundamental. Together with the comprehensive energy conservation measures taken, this means that a conventional central heating system is not necessary, although they are sometimes installed due to client skepticism. Instead, Passive houses sometimes have a dual purpose 800 to 1,500 watt heating and/or cooling element integrated with the supply air duct of the ventilation system, for use during the coldest days. It is fundamental to the design that all the heat required can be transported by the normal low air volume required for ventilation. A maximum air temperature of 50 °C (122 °F) is applied, to prevent any possible smell of scorching from dust that escapes the filters in the system. The air-heating element can be heated by a small heat pump, by direct solar thermal energy, annualized geothermal solar, or simply by a natural gas or oil burner. In some cases a micro-heat pump is used to extract additional heat from the exhaust ventilation air, using it to heat either the incoming air or the hot water storage tank. Small wood-burning stoves can also be used to heat the water tank, although care is required to ensure that the room in which stove is located does not overheat. Beyond the recovery of heat by the heat recovery ventilation unit, a well designed Passive house in the European climate should not need any supplemental heat source if the heating load is kept under 10 W/m². Because the heating capacity and the heating energy required by a passive house both are very low, the particular energy source selected has fewer financial implications than in a traditional building, although renewable energy sources are well suited to such low loads. To minimize the total primary energy consumption, the many passive and active daylighting techniques are the first daytime solution to employ. For low-light days, non-daylighted spaces, and nighttime, the use of creative-sustainable lighting design using low-energy sources can be used. Low-energy sources include 'standard voltage' compact fluorescent lamps, solid-state lighting with LED lamps, organic light-emitting diodes, PLED - polymer light-emitting diodes, 'low voltage' electrical filament-Incandescent light bulbs, compact Metal halide, Xenon, and Halogen lamps. Solar powered exterior circulation, security, and landscape lighting - with photovoltaic cells on each fixture or connecting to a central Solar panel system, are available for gardens and outdoor needs. Low voltage systems can be used for more controlled or independent illumination, while still using less electricity than conventional fixtures and lamps. Timers, motion detection and natural light operation sensors reduce energy consumption, and light pollution even further for a Passivhaus setting. Appliance consumer products meeting independent energy efficiency testing and receiving Ecolabel certification marks for reduced electrical-'natural-gas' consumption and product manufacturing carbon emission labels are preferred for use in Passive houses. The ecolabel certification marks of Energy Star and EKOenergy are examples. Fresh, clean air: Note that for the parameters tested, and provided the filters (minimum F6) are maintained, HEPA quality air is provided. 0.3 air changes per hour (ACH) are recommended, otherwise the air can become "stale" (excess CO2, flushing of indoor air pollutants) and any greater, excessively dry (less than 40% humidity). This implies careful selection of interior finishes and furnishings, to minimize indoor air pollution from VOC's (e.g., formaldehyde). This can be counteracted somewhat by opening a window for a very brief time, by plants, and by indoor fountains. Because of the high resistance to heat flow (high R-value insulation), there are no "outside walls" which are colder than other walls. Homogeneous interior temperature: it is impossible to have single rooms (e.g. the sleeping rooms) at a different temperature from the rest of the house. Note that the relatively high temperature of the sleeping areas is physiologically not considered desirable by some building scientists. Bedroom windows can be cracked open slightly to alleviate this when necessary. Slow temperature changes: with ventilation and heating systems switched off, a passive house typically loses less than 0.5 °C (1 °F) per day (in winter), stabilizing at around 15 °C (59 °F) in the central European climate. Quick return to normal temperature: opening windows or doors for a short time has only a limited effect; after apertures are closed, the air very quickly returns to the "normal" temperature. Some have voiced concerns that Passivhaus is not a general approach as the occupant has to behave in a prescribed way, for example not opening windows too often. However modelling shows that such concerns are not valid. In the United States, a house built to the Passive House standard results in a building that requires space heating energy of 1 BTU per square foot (11 kJ/m²) per heating degree day, compared with about 5 to 15 BTUs per square foot (56-170 kJ/m²) per heating degree day for a similar building built to meet the 2003 Model Energy Efficiency Code. This is between 75 and 95% less energy for space heating and cooling than current new buildings that meet today's US energy efficiency codes. The Passivhaus in the German-language camp of Waldsee, Minnesota was designed under the guidance of architect Stephan Tanner of INTEP, LLC, a Minneapolis- and Munich-based consulting company for high performance and sustainable construction. Waldsee BioHaus is modeled on Germany's Passivhaus standard: beyond that of the U.S. LEED standard which improves quality of life inside the building while using 85% less energy than a house built to Minnesota building codes. VOLKsHouse 1.0 was the first certified Passive House offered and sold in Santa Fe New Mexico. In the United Kingdom, an average new house built to the Passive House standard would use 77% less energy for space heating, compared to the circa-2006 Building Regulations. In Ireland, it is calculated that a typical house built to the Passive House standard instead of the 2002 Building Regulations would consume 85% less energy for space heating and cut space-heating related carbon emissions by 94%. A net zero-energy building (ZEB) is a building that over a year does not use more energy than it generates. The first 1979 Zero Energy Design building used passive solar heating and cooling techniques with air-tight construction and super insulation. A few ZEB's fail to fully exploit more affordable conservation technology and all use onsite active renewable energy technologies like photovoltaic to offset the building's primary energy consumption. Passive House and ZEB are complementary synergistic technology approaches, based on the same physics of thermal energy transfer and storage: ZEBs drive the annual energy consumption down to 0 kWh/m² with help from on-site renewable energy sources and can benefit from materials and methods which are used to meet the Passive House demand constraint of 120 kWh/m² which will minimize the need for the often costly on-site renewable energy sources. Energy Plus houses are similar to both PassivHaus and ZEB but emphasize the production of more energy per year than they consume, e.g., annual energy performance of -25 kWh/m² is an Energy Plus house. In a tropical climate, it could be helpful for ideal internal conditions to use energy recovery ventilation instead of heat recovery ventilation to reduce the humidity load of ventilation on the mechanical dehumidification system. Although dehumidifiers might be used, heat pump hot water heaters also will act to cool and condense interior humidity (where it can be dumped into drains) and dump the heat into the hot water tank. Passive cooling, solar air conditioning, and other solutions in passive solar building design need to be studied to adapt the Passive house concept for use in more regions of the world. There is a certified Passive House in the hot and humid climate of Lafayette, Louisiana, USA, which uses energy recovery ventilation and an efficient one ton air-conditioner to provide cooling and dehumidification. Solar access is a very important factor in any design of a passive house as it allows the structure to use the solar energy to heat and light the space naturally, replace electrical water heaters with solar-energy-based water heaters. ^ a b Zeller, Jr., Tom (September 26, 2010). "Beyond Fossil Fuels: Can We Build in a Brighter Shade of Green?". The New York Times. p. BU1. ^ a b c d e f Gröndahl, Mika; Gates, Guilbert (September 25, 2010). "The Secrets of a Passive House". The New York Times. Retrieved September 27, 2010. ^ "Definition of Passive House". PassivHaustagung.de. Archived from the original on October 5, 2012. ^ Thomson, Emily. "The homes on the rise in Norfolk, but what is a Passivhaus?". Eastern Daily Press. Retrieved 2018-08-07. ^ "Passivhäuser halten Sommerhitze gut stand". EnBauSa News: Energetisch Bauen und Sanieren (in German). Retrieved 2018-08-07. ^ "Chicago's Most Energy Efficient Home Resides In Hyde Park". CBS Local Chicago. 2018-02-05. Retrieved 2018-08-07. ^ "Minergie-Standard". Minergie.ch (in French). Archived from the original on November 18, 2007. ^ Ji, Yan; Plainiotis, Stellios (2006). Design for Sustainability. Beijing: China Architecture and Building Press. ISBN 978-7-112-08390-9. ^ a b c Rosenthal, Elisabeth (December 26, 2008). "Houses With No Furnace but Plenty of Heat". The New York Times. Retrieved December 27, 2008. There are now an estimated 15,000 passive houses worldwide, the vast majority having been built in German-speaking countries or in Scandinavia in recent years. ^ "Timber Frame takes the Passivhaus tour". Building Talk.com. January 23, 2009. Archived from the original on February 15, 2012. Retrieved June 5, 2009. ^ "Home". Institute for Housing and the Environment. Retrieved December 11, 2017. ^ Feist, Wolfgang (September 2006). "15th Anniversary of the Darmstadt - Kranichstein Passive House". PassivHaustagung.de. Archived from the original on July 14, 2014. Retrieved December 11, 2017. ^ "Forgotten Pioneers of Energy Efficiency". GreenBuildingAdvisor.com. 2009-04-17. Retrieved October 25, 2017. ^ "11th International Conference on Passive Houses, 2007". PassivHaustagung.de. Archived from the original on December 31, 2008. Retrieved December 11, 2017. ^ Cox, Peter (2005). "Passivhaus" (PDF). Building for a Future. Vol. 15 no. 3. pp. 16–22. Archived from the original (PDF) on September 26, 2006. Retrieved December 11, 2017. ^ "Willkommen to Das BioHaus!". Waldsee BioHaus Environmental Living Center. Retrieved December 11, 2017. ^ "The O'Neil Retrofit Remodel". Passivworks.com. Retrieved December 11, 2017. ^ "The Smith House 2002–2003". E-colab.org. Retrieved December 11, 2017. ^ "PHIUS Milestones". Passive House Institute United States. Retrieved November 1, 2018. ^ "Mission & History". Passive House Institute United States. Retrieved November 1, 2018. ^ "Wicklow Passive House - Out of the Blue". Passive House Association of Ireland. February 3, 2013. Retrieved December 11, 2017. ^ "2002 - Out Of The Blue". MosArt.ie. Archived from the original on September 26, 2013. ^ "Passive Resistance". Construct Ireland.ie. Archived from the original on December 20, 2011. Retrieved December 11, 2017. ^ "Home". Scandinavian Homes Ltd. Retrieved December 11, 2017. ^ "How to build a house in days". Diss Express. March 5, 2009. Archived from the original on May 15, 2009. Retrieved December 11, 2017. ^ "Passive House In Beerse Near Antwerpen Belgium". r-m-p-architects.com. Retrieved December 11, 2017. ^ "Climate Seeks Protection in Heidelberg". Retrieved December 16, 2011. ^ Mandapam, Bince. "Qatar to unveil its first Passive House in 2013". Online Qatar.com. Retrieved December 11, 2017. ^ "Passive House requirements". Passivhaus Institut. Retrieved December 11, 2017. ^ "Concepts and market acceptance of a cold climate Passive House" (PDF). passivhusnorden.no. Retrieved December 11, 2017. ^ "Promotion of European Passive Houses". EuropeanPassiveHouses.org. Archived from the original on June 28, 2012. ^ "PHIUS + 2015: Passive Building Standard - North America". www.phius.org. Retrieved November 1, 2018. ^ "PHIUS + 2015: Passive Building Standard North America Guidebook" (PDF). www.phius.org. Retrieved November 1, 2018. ^ "QA/QC Training Programs". www.phius.org. Retrieved November 1, 2018. ^ Delleske, Andreas. "What is a Passive house?". Passivhaus-vauban.de. Retrieved December 11, 2017. ^ "The Passive House – sustainable, affordable, comfortable, versatile". International Passive House Association. Retrieved December 11, 2017. ^ Hill, Steven (2010). Europe's Promise: Why the European Way Is the Best Hope in an Insecure Age. University of California Press. p. 172. ISBN 978-0-52024-857-1. ^ Siegle, Lucy (December 8, 2013). "How can I live in a passive house?". The Guardian. Retrieved December 11, 2017. ^ Loviglio, Joann (June 12, 2013). "Highly efficient 'passive homes' gain ground in US". Yahoo! News. Associated Press. Retrieved December 11, 2017. ^ Adams, Duncan (February 9, 2014). "Energized about Passive House construction". The Roanoke Times. Retrieved December 11, 2017. ^ "The buzz in energy efficiency: 'Passive house' debuts in Austin". KXAN. February 19, 2014. Retrieved December 11, 2017. ^ "Cellar Ridge's 50/10 Homes Boast 50% Greater Efficiency for 10% More Money than Similar Homes". inhabitat.com. Retrieved December 11, 2017. ^ "Passive Houses in High Latitudes" (PDF). UCD Energy Research Group, University College Dublin. Retrieved December 11, 2017. ^ "Passive Houses in cold Norwegian climate" (PDF). UCD Energy Research Group, University College Dublin. Retrieved December 11, 2017. ^ a b c Swanson, Herb (September 26, 2010). "Energy Efficiency, a Step Further". The New York Times. Retrieved September 29, 2010. ^ "Insulation fact sheet". Department of Energy, Oak Ridge National Laboratory. January 15, 2008. Retrieved December 18, 2013. ^ Holladay, Martin (June 1, 2012). "Belgian Passivhaus is Rendered Uninhabitable by Bad Indoor Air". Green Building Advisor. Retrieved June 14, 2012. ^ Zeller, 2010. p.BU1. Example: in the case of the Landau home described in the NYT's article, several insurance companies refused to insure their home when they were told there was no home furnace in the structure, fearing that they would be held financially liable for frozen water pipe damage. ^ "Passive House Estate in Hannover-Kronsberg" (PDF). Passivhaustagung.de. p. 72. Retrieved December 11, 2017. ^ "What is Passive House?". www.passivehouseacademy.com. Retrieved December 11, 2017. ^ Blight, T. S.; Coley, D. A. (2013). "Sensitivity analysis of the effect of occupant behaviour on the energy consumption of passive house dwellings". Energy and Buildings (66): 183–192. ^ "Design & Architecture". Waldsee BioHaus Environmental Living Center. Retrieved December 11, 2017. ^ Weber, Cheryl (July 19, 2012). "EHDA Grand Award: VOLKsHouse". EcoBuilding Pulse. ^ "Energy Saving Potential of Passive Houses in the UK" (PDF). UCD Energy Research Group, University College Dublin. Retrieved December 11, 2017. ^ "Passive Houses in Ireland" (PDF). UCD Energy Research Group, University College Dublin. Retrieved December 11, 2017. ^ Defendorf, Richard (July 7, 2010). "Following Up on a Passive House in the Deep South". GreenBuildingAdvisor.com. Retrieved December 11, 2017. ^ Clearfield, Lynne (2011). "Passive House, Aggressive Conservation". Solar Today. 25 (1): 22–25. Mansoori, G. A.; Enayati, N.; Agyarko, L. B. (2016). Energy: Sources, Utilization, Legislation, Sustainability, Illinois as Model State. Singapore: World Scientific Publishing Co. doi:10.1142/9699. ISBN 978-981-4704-00-7. Keenan, Sandy (August 14, 2013). "The Passive House: Sealed for Freshness". The New York Times. p. D-1. Raver, Anne (August 14, 2013). "In Pursuit of the Perfectly Passive". The New York Times. p. D-1. Homod, Raad Z. (May 2013). "Energy savings by smart utilization of mechanical and natural ventilation for hybrid residential building model in passive climate". Energy and Buildings. 60: 310–329. doi:10.1016/j.enbuild.2012.10.034. Wikimedia Commons has media related to Passive house. This page was last edited on 7 February 2019, at 18:46 (UTC).